With the Intel Xeon D-1500 family, we had dual 10Gb Ethernet onboard the SoC for the first time. When we were first investigating the Intel Xeon D’s onboard 10G LAN our go-to platform was a highly customized software development platform that Intel sent. Here is the Intel Xeon D/ Beverly Cove piece where we first saw the Intel X552 Ethernet controller in Windows Server 2012 R2. Today we have confirmation from our lab’s production sample. 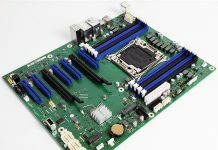 For this investigation we used our Supermicro X10SDV-TLN4F which has both an onboard Intel i350-t2 gigabit Ethernet controller and onboard 10GbE. We used Windows Server 2012 R2 Standard for our testing but this should apply to most versions of the latest Windows operating systems. One note here: we did utilize drivers provided by Intel in our testing. From what we understand, these drivers will be integrated into forthcoming standard driver releases which will be good to see. The support of the Xeon D’s integrated 10Gb networking seems to be just hitting stride with significant portions of the validation process reaching milestones at several vendors. Heading to the device manager under installation, we were greeted with all four network ports available on our Supermicro X10SDV-TLN4F review sample. As one can see, we have the Hyper-V Virtual Ethernet Adapter (we now test Hyper-V with all hardware in the STH lab.) Next there are the two Intel(R) Ethernet Connection X552/X557-AT 10GBASE-T connections. 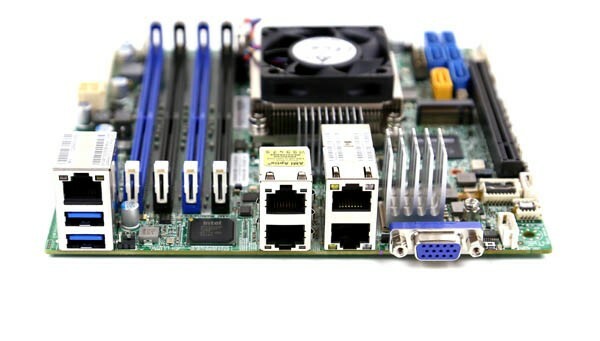 These are followed by our Intel i350-t2 NICs. For those looking through logs of foreign systems, the Intel X552 or X557 10Gbase-T adapters seem to be exclusive to the Intel Xeon D platform at the moment. This year we will see 10 gigabit Ethernet become mainstream as more of the SoC offerings from Intel and other vendors embed 10 gigabit Ethernet controllers. Now if only the switch vendors would catch up and provide lower cost switches. Were you able to get the X552/X557 working under ESXi? I did not see compatibility for either 5.5 or 6.0. Did you have to create your own .vib to inject into the ISO? Thanks! Any idea how much power the 10Gbe controller consumes? Will the 10Gbe ports function with 1Gbe equipment, or can they be disabled to save power?